More and more, new dental patients want to know about what the dentist is going to do to them and the reasons why. This was a guiding factor in the development of the Dental Wellness Center’s mission of patient education. Although the academic training of dentists and physicians is essentially the same from school to school, after graduation the preponderance of practitioners practice in a similar manner, while others find niches of care that vary from the mainstream allopathic mode, such as alternative, integrative or functional medicine, and in dentistry, a more holistic view. One area in dentistry where there seems to be a large divide is in the field of endodontics1, or root canal therapy, which has to do with the safety of root canalled teeth. I wrote this article to inform patients and potential patients about my take on root canal treatments and the rationales behind my reasoning. When patients or potential patients seek my advice about root canal treatment, my position regarding this subject is in keeping with our practice mission of patient education – I recommend that they read this article prior to our consultation so that we can have an informed conversation. We refer them to scientifically-based informational sources (supportive information below: references 1 – 7) to help them decide whether or not having a root canal treatment or removing a tooth that has had a root canal treatment might be suited for them, based upon their particular circumstances. Root canal treatments are available as an alternate to extraction to “save” a tooth whose inner nerve (pulp) has become diseased from tooth decay; trauma from aggressive grinding away of tooth structure during a repair process; multiple tooth repairs over time; or a tooth fracture involving the pulp. The pain/swelling can manifest immediately after a deep filling or crown procedure, or some time afterwards. In fact, pulp tissue can die within a tooth that has been repaired years earlier – with or without pain. Many patients want all white teeth, and porcelain crowns are popular, especially in California. However, as stated above, they require more removal of sound tooth structure than any other dental repair procedure. Ask any root canal specialist and they will tell you that teeth with porcelain crowns are the ones they treat most. In repairing a tooth that is quite broken down from previous large fillings and/or tooth breakage, I prefer to provide a conservative, individually designed and engineered restoration requiring minimal removal of good tooth structure, in contrast to a crown that, while easier and faster to perform, requires much more good tooth structure removal, hence trauma to the pulp. If the attempt to save the vitality of a dental pulp with medication fails and the nerve ends up getting sick and dying. A tooth having deep decay with symptoms of spontaneous toothache. A tooth having a toothache that is relieved with cold water, but worsens with warm substances. When a tooth that has recently had deep decay repaired develops spontaneously painful symptoms. When the pulp of a tooth with an existing large filling or crown simply dies from the accumulation of past decay and repair trauma(s). As indicated, this can occur at a time well after the last dental procedure performed on the tooth. When a tooth has been prepared for a full crown and has pain afterwards that does not go away. When a tooth that previously had a root canal still shows x-ray evidence of infection around its root(s) (an attempt may be made to re-treat it). When a broken tooth with a healthy pulp doesn’t have enough remaining tooth structure to hold a lasting repair. If there is enough tooth structure remaining, an intentional root canal treatment allows placement of an internally-reinforced system that allows for a stable restoration, such as an onlay or crown. When teeth have been damaged from an uneven bite. Actual testing shows that the muscles of the mouth can exert well over 500 pounds per square inch of pressure on back teeth. An uneven bite causes excess pressures on teeth resulting in their taking more than their share of the load. This, along with the possibility of the conditions listed above, aggravate the pulp over a period of time and can cause pulpal death. I see this quite often, and it saddens me as the root canal treatment does not begin to address the cause for its need, only the symptoms caused from the uneven bite, and thusly even after root canal treatment, the pain can remain. A word about the tooth pulp tissue, which is commonly called the “dental nerve.” A tooth is an amazing part of the human body. It is somewhat of an organ in itself, with an enclosed system of hollow chambers and canals with live tissue within them. The roots are encased within a sausage-like “skin” called a periodontal membrane that essentially connects the tooth to its surrounding bone. The two-rooted tooth in the picture below shows one main canal in each of its two roots. The brown lines extending from these canals represent the myriad of mini-tubules (microscopic root canals) that contain live tissue as well. In this example, if the pulp died, the two main canals might be able to be cleaned out with root canal instruments. However, the tissue within the miles of mini-tubules dies as well. Dead pulp tissue is essentially “dead meat” that can harbor millions of pathogens (bad bacteria). The images below represent actual pulp tissue lying within teeth – more complexly configured anatomically than those shown in the above image. There are no root canal instruments capable of removing all of this pulp tissue; not to mention the mini-tubules that emanate from them that are not shown in this image, but are shown in the image above. Live pulp tissue is composed of blood vessels, nerves, lymphatic tissue and cells (odontoblasts) that originally formed the tooth, and they continue to lay down protective secondary dentin (root material) as internal protective insulation in response to the many mini – and maxi-traumas that a tooth and its dental pulp undergo through a person’s lifespan. This can include teeth grinding and clenching; chewing ice; accidental traumatic blows to the teeth; dental decay; multiple repairs; and tooth breakage. All these events inspire the odontoblasts to insulate the underlying roof of the pulp chamber and their associated canals through continually lining them with secondary dentin, or root material, from the inside. These internal chambers and canals within the teeth therefore become naturally smaller and constricted as we age, depending upon the amount of above-mentioned insults they receive throughout life. This is why adult pulp tissue, after deep decay removal and placement of a healing medication under the tooth repair would have a lesser chance of healing, because there is less blood circulating through the canals. This makes it especially important to perform conservative repairs that remove minimal tooth structure resulting in the least trauma to a pulp. Children and young adults, however, have large root canals with a massive amount of blood flow through the tooth which is needed for the healing process to occur; therefore the pulp tissue within their teeth have a much higher chance of surviving the decay removal and repair process. 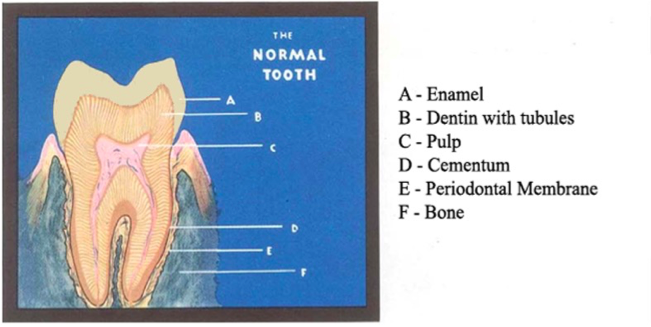 A tooth with a diseased or completely dead pulp has bacteria within the main pulp canal(s) as well as the myriad of small canals (tubules) that spring from them within the internal root structure of the tooth (per 1st image above). In a root canal treatment procedure, the diseased pulp tissue within the main, larger canals is removed, then irrigated, dried and filled with gutta percha and a sealer. Most often, however, the canals are not round, but oblong, as well as having other non-round configurations (per 2nd image above). There can be no disagreement that some pulp tissue will still remain in the odd shaped canals and inaccessible smaller canals, and for sure within the miles of mini tubules that spring laterally from the larger canals – reservoirs for bacteria as well. We don’t need to keep all of our teeth to be healthy. There are healthy ways to replace teeth, and certain teeth can be missing that wouldn’t be noticed with even the biggest of smiles, with minimal or no compromise in chewing function. Titanium root replacement implants have a good record of safety and longevity, and now ceramic (zirconia) implants are available that are essentially non-allergenic. Removable partial denture technology has improved considerably as well, fabricated from strong non-metallic, non-allergenic material that when well-designed, can defy detection and stay in place while chewing. It is important to note that when teeth are removed, most often the adjoining teeth will shift out of their normal positions into the missing tooth space. This can compromise their periodontal (gum) health and cause an uneven bite that can result in major problems down the road. If these spaces are in the back of the mouth, a clear orthodontic retainer can be made and worn at night to keep the shifting from occurring without a need for a tooth replacement. Our mission at the Dental Wellness Center aligns with that of the IAOMT (#3 link below). The above information has been developed in order to assist you in making an important decision relative to the status of your oral and general health. Below are other links/references having to do with the topic of root canals, including a report from the American Academy of Endodontics (AAE) – the main organization of endodontists. Understand what happens systemically when you have a root canal. Important information in order to make informed decisions regarding your oral and overall health.